Raumfahrt+Astronomie-Blog von CENAP - Blog: Raumfahrt - Space tourism will surely be a blast, but can it also improve life on Earth? My body is suspended midair, and it’s all I can do to breathe steadily. Everything around me is whitewashed. The padded ceiling and floor have blurred. I’m not consciously twitching a muscle, yet I’m moving. And I’m laughing — uncontrollably — because my mind cannot accept the absurdity of what my body knows to be true: I’m flying. I am onboard a Boeing 727 owned by the Zero Gravity Corp. It’s the only commercial plane that has been approved by the Federal Aviation Administration to take passengers on a journey that re-creates the weightlessness of space. Without leaving the atmosphere, the aircraft — known as G-Force One — flies upward, then lunges toward the earth in a parabolic pattern, creating a zero-gravity environment in its cabin. A flight coach is standing over me, poised with a bottle of water. Orbs float out. My fellow passengers’ mouths pucker, vying for bait. One woman attempting to catch water in her mouth misses, and a mercury-like glob slides across her face. When I reach out to touch a mass of water quivering before me, my finger slices through its center. Where there was one orb, there are now two. They drift away from each other, away from me. It’s a gift of physics, but it feels like magic. I have a tendency to seek out remarkable experiences — eclipses, tornadoes, vast animal migrations. I’ve never been particularly interested in space, but I’ve long been intrigued by travel’s ability to stretch the boundaries of perception. So when I met a former Zero G participant who referred to her flight as “the most awe-inspiring” journey of her uber-adventurous life, I started researching how to book passage. 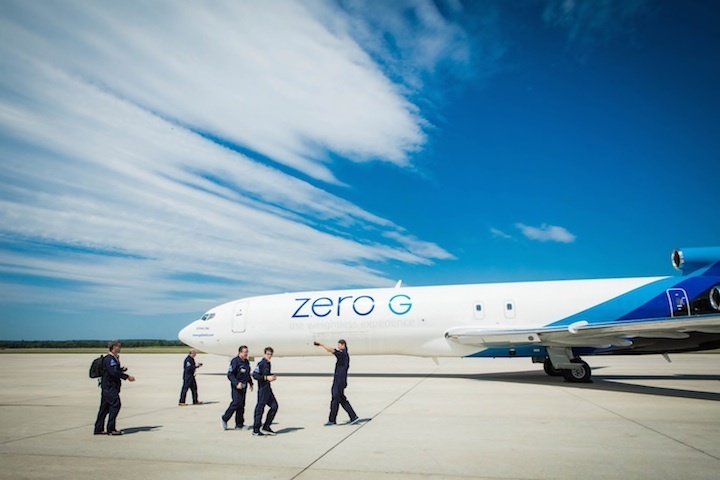 Zero G, based out of Arlington, Va., was founded in 1993, but it wasn’t cleared for commercial flights until 2004. G-Force One maneuvers at degrees so acute that existing regulations would have required passengers to wear parachutes. For years, the FAA seemed perplexed to the point of inaction by the idea of a commercial zero-gravity flight. 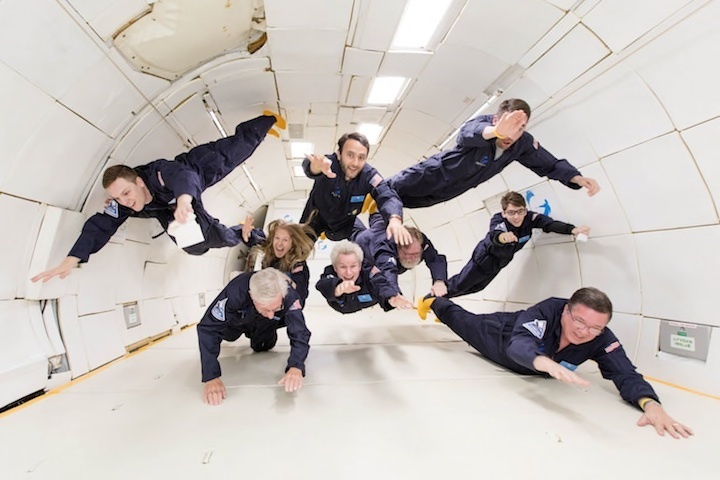 According to Zero G representatives, FAA officials sometimes wondered aloud: Who in the world would want to do this? A ride on Virgin Galactic’s spacecraft will cost $250,000. And yet, despite the sticker shock, roughly 700 people, from 50 countries, have signed up — even though the company doesn’t have a hard launch date. Already Virgin Galactic has enlisted more people than have traveled to space in all of human history. Surely space tourism, once experienced on a mass scale, will affect humanity — and not just because it will open up new vacation opportunities, but because it could reshape us socially, culturally, emotionally. My Zero G experience gave me a window into how this might unfold: how space travel could prove consequential in ways that are difficult to imagine from this point in history. There’s even a chance it might improve life on Earth. So does self-proclaimed “space geek” Louis Lebbos, 36, who’d arrived from Portugal. Minutes after we met, he was showing me childhood photos of himself wearing a NASA T-shirt. Lebbos chose to pursue a career in digital entrepreneurship rather than employment with a space agency. But he and Birckenstaedt — dreamers of the same dream, from two sides of the world — had both finally found their way to zero gravity. “We’re almost astronauts!” Lebbos told me. When G-Force One pilots gathered at the front of the room, they informed us that they’d be taking us out of the Washington area and into approved airspace over the Atlantic — a necessity since parabolic-maneuvering planes have a tendency to “scare people” on the ground and can create 911-call overloads. We’d generally be at the same altitude as commercial planes, but there would be points in the parabolic pattern when we’d be plummeting toward the earth at 26,000 feet per minute. We entered G-Force One through a staircase at its tail. There were a few rows of belted seats at the back, where we strapped in for a 30-minute flight over the ocean to reach our approved airspace. Before us stretched a windowless, seatless cabin coated in gymnastic padding. A flight attendant came on the intercom to announce that we were currently traveling with normal gravity, and I realized something had been nagging at me: Since I’d never existed outside of gravity’s grasp, there was no way for me to understand the force of what I’d been up against. A Zero G flight is, through subtraction rather than addition, a proper introduction to a phenomenon I’d taken for granted as some inextricable part of my being. As we waited, I studied the ceiling, a patchwork of foam pieces cut to fit around fluorescent light fixtures. Soon our flight coach invited us to pad across the floor in uniform socks the color of egg yolks. There, she instructed us to lie flat on our backs. I immediately focused on a fixed point to prevent motion sickness. I’d read that deep breathing might prevent nausea, so I also started inhaling and exhaling like a woman in labor. The overview effect is a mostly visual phenomenon; and in a zero-gravity plane, you don’t, of course, get to see Earth at a distance. Yet there is something about the weightlessness of G-Force One that inspires its own kind of awe. And awe itself can lead to what David Yaden, a researcher at the University of Pennsylvania’s Positive Psychology Center, describes as self-transcendence — the experience of shedding one’s sense of self to feel part of something larger. Yaden, who studies awe, flow, mindfulness and other varieties of experience, suspects that if he and his neuroscientist colleagues attached monitors to G-Force One passengers, they’d find decreased activation in passengers’ brain regions that regulate both spatial awareness and sense of self during flight. The vehicle lurches forward. It veers right. We’re no longer on the Vomit Comet, but people are still throwing up. According to Zero G’s promotional materials, roughly 5 percent of passengers get sick. Of the six people who sat in my row during our belted airspace time, the percentage was 50. And every one of the besieged said they’d do it all over again. After the group disperses, I decide to go to the Steven F. Udvar-Hazy Center in Chantilly, Va. It’s only five miles away, and — as a companion facility to the Smithsonian’s Air and Space Museum on the Mall — it seems a fitting pilgrimage. It’s only when I get to the front entrance that I realize I’m still wearing my flight suit. Despite the fact that I look ridiculous — like some sort of fangirl at an astronomy conference — I’m too tired to change. When I reach the center’s space hangar, I stand nose-to-nose with the space shuttle Discovery and stare. If I’d come yesterday, I would have gotten lost in the intricacies of the shuttle’s exterior tiles. I would’ve focused on hardware. Now, part of me is actually bracing for unseen forces to send me into the rafters of this hangar.